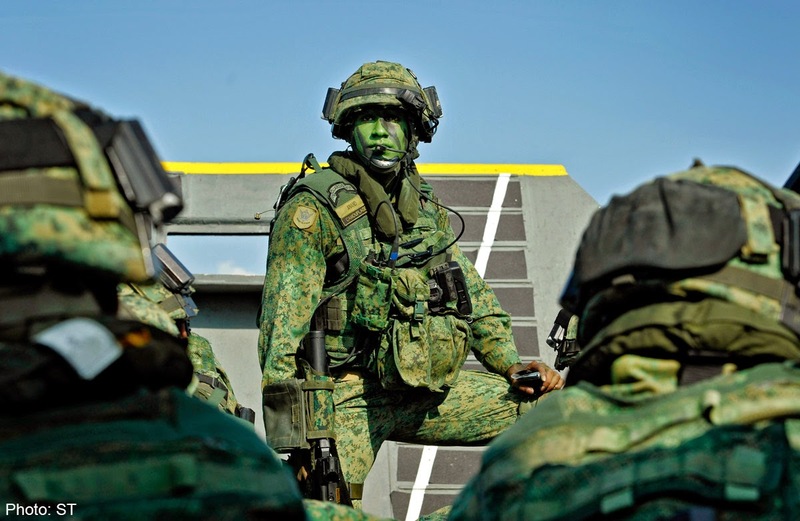 The Singapore Army – their new Type 4 Combat Uniform in a pixilated camouflage pattern. 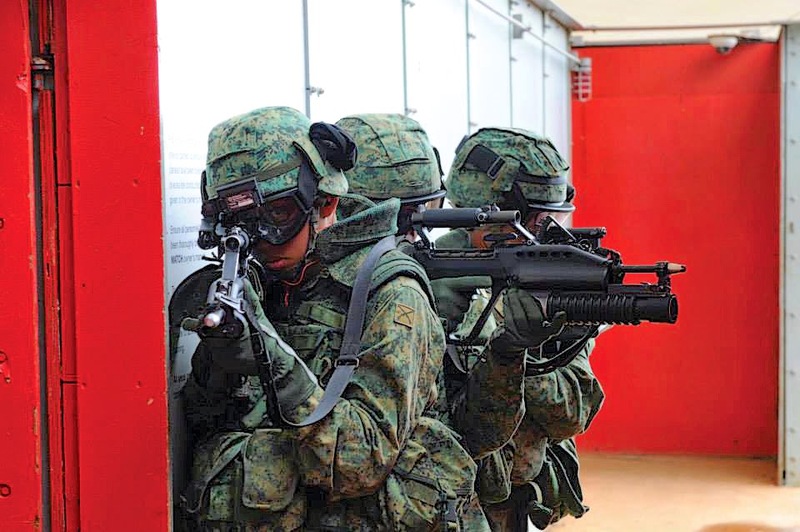 Which, whilst it might at first appear to be derived from or inspired as usual by CADPAT/MARPAT, closer inspection reveals that the pattern is actually quite distinctive – and clearly optimised for use in the tropical regions where the SAF expects to conduct operations. 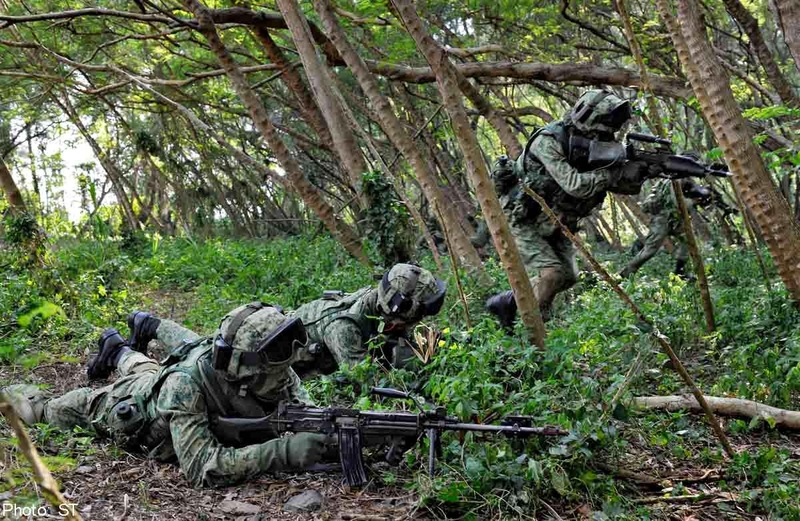 explanation from the Singapore Army is that becuase of the advanced surveillance equipment and weapon optics in use today, soldiers face a greater risk of detection in combat. 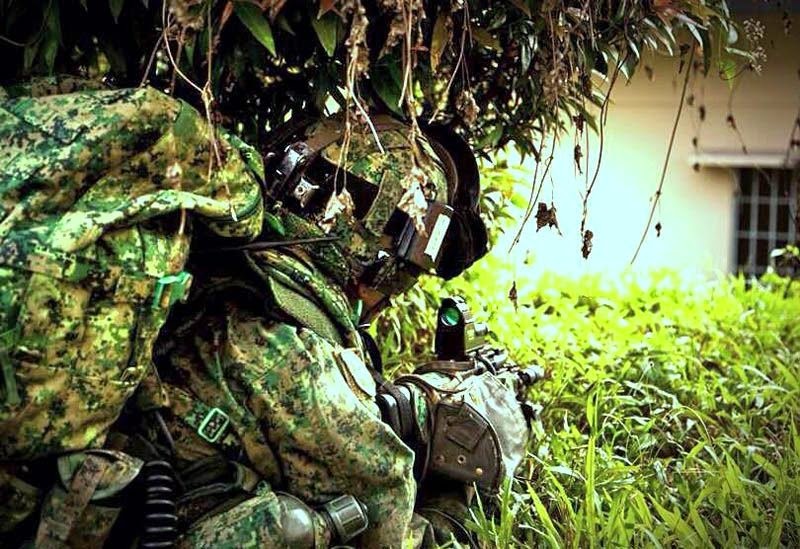 Recognising this, the Singapore Army and the Defence Science & Technology Agency (DSTA) jointly developed the new SAF combat uniform with an enhanced camouflage pattern to reduce detection – based on the science of human visual performance and visual biophysics. Research was done to see how the defined boundary lines in the current camouflage pattern could be replaced to improve the camouflage capability of the combat uniform. Pixels were used to break up boundary lines and to generate a quivering effect. This affects the ability of the eye to see solid lines and the brain to detect recognisable shapes, resulting in a slower detection rate of the pixelised camouflage pattern at short distances (micro-pattern). Viewed at longer distances, the pixelised camouflage works just like the traditional camouflage which comprises pattern shapes (macro-pattern).Further research was done to determine the combination of colour and shades used in the new combat uniform. The research involved capturing images in various operating environments at different distances and lighting conditions, for feature analysis and colour selection. These images were segmented into pixels to generate the patterns used in the uniform’s design. Field trials were then conducted to fine-tune the design and colour of the camouflage patterns.Finally, it was noted that night vision devices negated the effects of pixelisation by showing all colours in the camouflage pattern as a single tone. 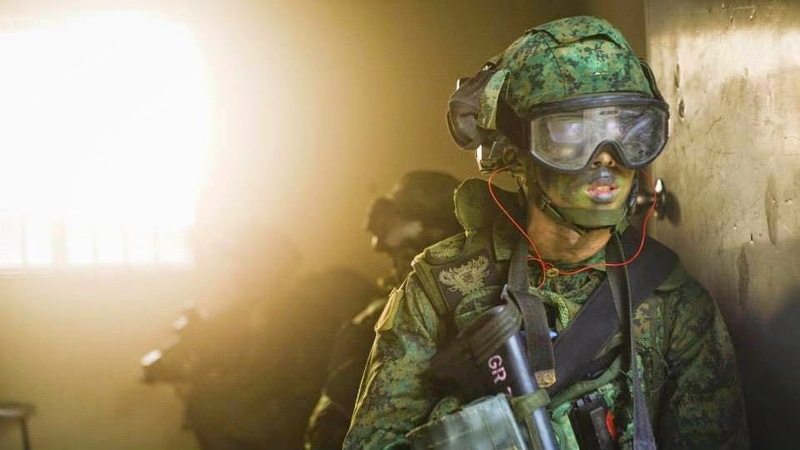 To counter detection by night vision devices, the material used in the new SAF combat uniform was given Near Infra-red (NIR) treatment to ensure that every colour in the camouflage pattern reflected a different wavelength. This maintains the pixelised camouflage effect when viewed through night vision devices.The trials involving different terrain and distances in both day and night conditions showed that the new camouflage pattern was significantly more effective than the current one.So, however much it may or may not resemble CADPAT/MARPAT, one thing is for certain – it clearly performs better in the jungle than the “Woodland/Leaf Pattern” combat uniform it is replacing. Improving the soldiers’ comfort was another important design consideration, and to this end the uniform uses a new lighter fabric which is highly permeable and has a high wicking capability. This fabric provides better air flow, which in turn allows faster heat dissapation, and it dries twice as fast as the old uniform when wet. 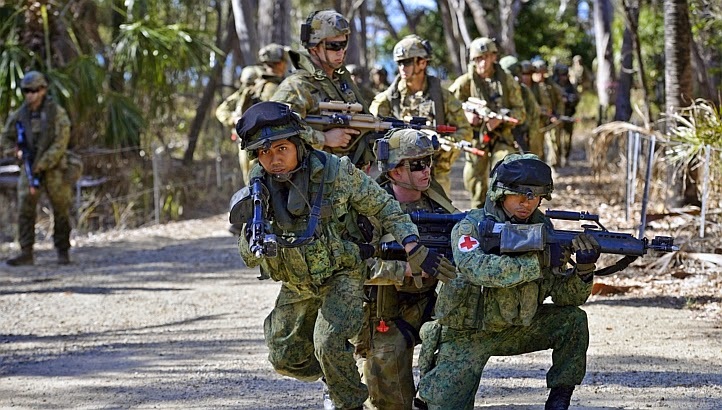 Very important considerations for operating in the hot humid environment of South-East Asia.The new combat uniform is designed to be highly functional as well. It aims to ergonomically integrate with the soldier’s personal equipment by eliminating pressure points on the soldier’s body and protecting it against abrasion from the use of body armour. It also allows for knee and elbow guards to be secured to the uniform and has additional pockets for storage.